We asked our local gelotologist about how important it was to start and end your day with a smile. Their response… well… it made us smile! A smile makes you beautiful. It’s scientifically proven that a smile will attract others and make you more physically attractive to them. 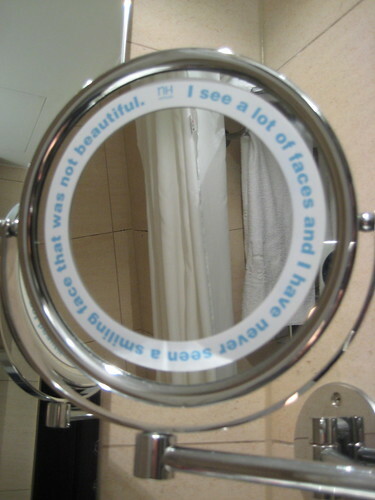 Below, we’ve listed a few other reasons to smile but, in the meantime, take a look in our special NH mirror and start feeling beautiful! Research has shown that laughing and smiling can do wonders for your mood, your health, your relationships and even your abs! Any mirth-related activity, from a cheeky grin to a full-fat belly laugh, will release mood-enhancing hormones like endorphins, and decrease stress-inducing hormones like cortisol. There is also a lot of research going into the notion that laughing helps your body release more antibody producing cells and improves the performance of T cells. Both of these are essential components of our immune systems. It’s well known that a smile uses a lot fewer muscles than a frown, but did you know that a big ol’ laugh will work out your diaphragm, your heart, your abdominal muscles and your shoulders? So there we have it: start and end your day with a smile and you’re well on your way to health and happiness. hay where can you buy one of these mirrors ? ?